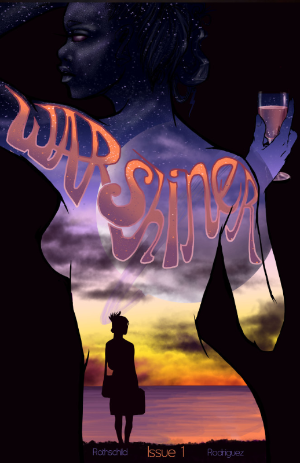 The Fellowship was fortunate enough to obtain a copy of WARSHINER #1, a self-published comic. Rebecca Rothschild writes, and Katie Rodriguez draws and colors. Evelyn has just arrived on Idori, and is quickly discovering how beautiful the planet is. She had to leave Earth in a hurry, but as a botanist she has skills that are very useful to certain unsavory elements. See, she knows how to make the most sought after substance in the known universe – alcohol. And she’s about to get really popular among those unsavory elements. The premise of this story is a very simple one – it’s all about the booze. But that’s the only thing that’s simple about it. Evelyn’s barely off the transport and she’s already getting herself involved in illegal alcohol production, and the ripples she’s making are being noticed. This issue is an amazing beginning to this multi-layered story, and the art really helps to spotlight both the beauty of this alien world and the ugliness that lies beneath the surface. For a middle-aged scientist, Evelyn sure seems to know how to find trouble. I already find myself hoping she can find a way out of it. It’s a compelling story, and I can’t wait to see where it takes us. WARSHINER #1 is available now online at warshiner.com.